Southerners weren't the first people in the world to fry their chickens. Almost every country has a version of fried chicken, or fricassee, from Vietnam's Gà Xaò to Italy's pollo fritto. The Scottish people who settled the early South might have introduced the method here in the United States. They preferred to fry their chickens, rather than baking or boiling them as the English did. It wasn't until the early 1900s that recipes for fried chicken began appearing in popular "northern" cookbooks. Fannie Farmer's 1896 cookbook only refers to "Fried Chicken" as a fricassee served with "Brown Sauce" or as oven-baked "Maryland Chicken." Mary Randolph, in the third printing of "Virginia House-Wife" (1828), told how to make fried chicken. Very simply, the chickens are cut up, dredged in flour, sprinkled with a little salt, put in a skillet with hot fat, and fried until golden brown. Through the years there have been hundreds of attempts to improve upon her recipe, and plenty of tricks and special touches, but they are all simply minor variations on the original. Mary Randolph mentions making a gravy with the "leavings," but the cream sauce so often served with fried chicken seems to have originated with the dish "Maryland fried chicken." In the cookbook, "Fifty Years in a Maryland Kitchen" (Baltimore, 1873), the only fried chicken recipe calls for a sauce made of butter, cream, parsley, salt, and pepper. There are hundreds of recipes for Southern fried chicken, and it is the center of more controversies than perhaps any other food item. From the seasoning and coating to the fat and cooking time, discussions of "real" southern fried chicken can start some lively debates throughout the South. Some people will tell you to remove the skin before battering, while others swear by double-dipping the chicken. Some fry in oil, some in butter, others in lard or bacon grease. The recipe in "The Foxfire Book of Appalachian Cookery" recommends browning before covering, then frying slowly and turning frequently. Camille Glenn, in "The Heritage of Southern Cooking" states that chicken is not dipped in milk, crumbs, or batter, but is simply dredged in flour, while the recipe in "Bill Neal's Southern Cooking" requires a soaking in buttermilk. James Villas, in "American Taste," soaks his chicken pieces overnight in milk and lemon juice, and cooks them in vegetable shortening with the addition of 4 tablespoons of bacon grease. 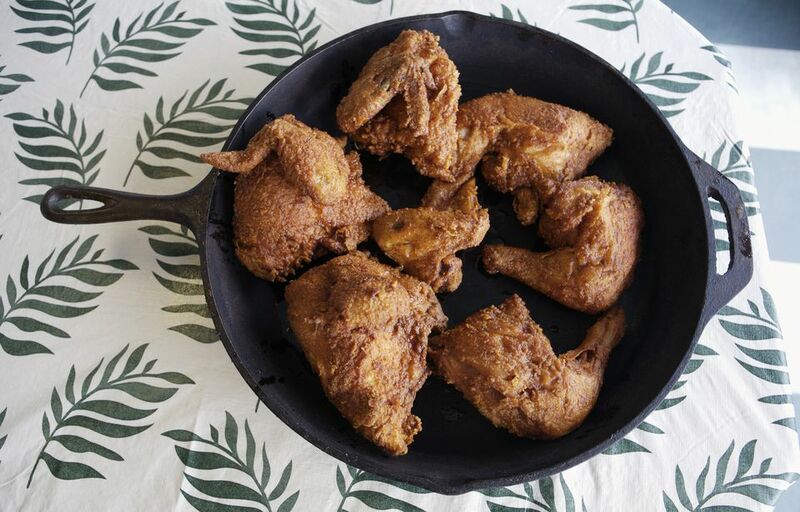 The few things everyone seems to agree on are that the skillet has to be a well-seasoned black iron one (preferably deep and with a cover), the chicken must be young and lean, and that you use your fingers to eat the fried chicken. Biscuits, coleslaw, and corn on the cob are popular side dishes to serve with fried chicken, especially for picnics and cookouts. Mashed potatoes with gravy or French fries are probably the overall favorites, but waffles, potato salad, macaroni and cheese, and macaroni salad are excellent choices as well. Get your trusty seasoned skillet out and try some of the recipes. Dip chicken pieces in evaporated milk mixed with a little egg before dipping in the dry coating mixture. For easy cleanup, use a plastic food storage bag or brown paper bag to coat the chicken with the dry coating mixture. Add some fiber (and texture) by adding bran or wheat germ to your coating mixture. To make the coating stick better, refrigerate the coated chicken (uncovered) for 30 to 60 minutes before frying. Try some cracker meal or crushed unsweetened cereals in the coating mixture. For super crispy fried chicken, use half flour and half cornstarch, with your usual seasonings and 1/2 teaspoon of baking powder. For a dry crispy coating, fry until browned, then finish cooking in a 350 F oven. Younger chickens, broilers, capons, fryers, roasters, and game hens are best for frying. Parts of the chicken you're not using should be put in a pot with some parsley, carrots, and water to cover. Simmer until the liquid has reduced by half, then strain and refrigerate. When chilled, skim the fat off the top and use in sauces and soups, or freeze for future use.